My trip to Khao Yai was very rewarding.After driving 2 hours from Saraburi,the rain catches me in the middle of the road,inside the national park.A heavy rain,with lightnings,really frightened me.Even more, lights of the headquarters were off so we decided to put our tent inside the canteen.After we woke up at 4 o clock,we brought our stuff to Laem Ta Kong campsite,at 6 km from the headquarters.I woke up quite early,around 6 o clock and I rode to Pa Glua Mai Campsite , as i knew some good spots for birdwatching.I walked along the road to Haew Suwat waterfalls.At around 7:00 o clock in the morning,in the first part of the road I could spot a couple of Banded Kingfisher,the male and the female,on the right side of the road,singing and perching on some lower branches.After watching me,they disappeared in the forest quite fast.As usually,a flock of White-crested Laughingthrush were making a lot of noise,on the left side of the road,meanwhile a conspicuous White-rumped Shama was singing and moving next to one side of the road.Furthermore,a Moustached Barbet appeared at the top of a tree.Green-billed Malkoha was another good bird to see,that i found in the first meters of this road.A Giant Squirrel was eating fruits,in a high tree,just before arrived to Pa Glua Mai. I came back to Laem Ta Kong at around 10 o clock,as it was getting hot.Around this area i could watch some common birds as a Dollarbird,Chinese Pond Heron,Red-wattled Lapwing and a Greater Coucal,picking up some branches on the grass.Other interesting birds that I saw were an Indian Roller,White-throated Kingfisher and a Common Flameback,near the headquarters.In the afternoon we saw a couple of Red Junglefowls on the way to Khao Khieo and a couple of Hill Mynas.Worth to mention was the sightings of White-handed Gibbons,near the junction to Prachinburi,and an Asian Elephant in the salt lick, near the Wildlife Tower, at around 2:30 o clock. 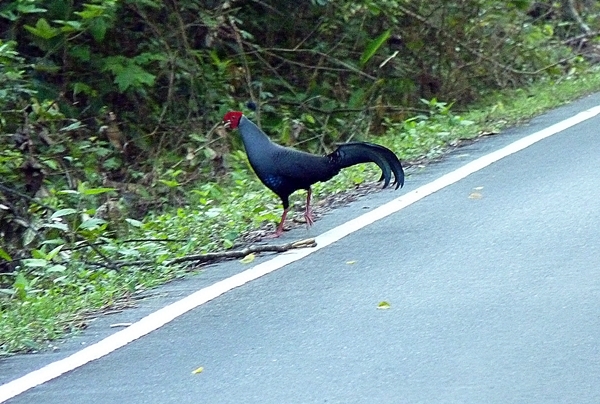 Next day we went to Pa Glua Mai campsite,but we didn t see to much to mention.Afterwards we went to the road to Khao Khiew and unexpectedly, the results were better.Just after 1 kilometer from the junction to Khao Khiew we saw the magnificent and superb Siamese Fireback !! the male, with its unmistakable red hood, and the female, at around 7 am.It was a small group of 4 individuals with one of the males displaying the yellow part of its back patch.I could take some pictures but as they were moving all time, the quality of them were not very good.They were walking on the road for 5 minutes and after went into the forest. We continued to drive farther but we didn ‘t spot none of them.So after decided to come back to the same point were we saw them before, I went into the forest, just near the road,where i could find some interesting birds as Greater Yellownape,Puff-throated Bulbul,Yellow-rumped Flycatcher,White-rumped Shama and White-crested Laughingthrush at 7:30 am.Near the road we spotted a Lesser Racket-tailed Drongo and the awesome Green Magpie, eating fruits,with its beautiful green body,bluish crown and its conspicuous red bill.Another great bird was a Long-tailed Broadbill,calling,in a tree without leaves next to the road.Chestnut-bellied Malkoha and Blue-winged Leafbird were other interesting birds.A bizarre thing was to see a couple of wild dogs crossing the road at that time !!!! In the afternoon we rode to km 33 at around 4 pm.Next to the road appeared a couple of Red-headed trogon and a Great Hornbill flying from a high branch at around the same time, 5pm. Very pleased for our trip,although most of these birds I already saw them on previous occasions,I am excited to go back there in a couple of weeks ! Sorry for my delay posting new posts but I was busy in my work.My trip to Krabi was not as I expected.After spending 12 hours by bus from Bangkok,finally I arrived to Krabi town.Without many tourists in it,Krabi town looks like a pleasant small town with not too many things to do there.The Krabi river, just beside the town, passes through a good mangrove forest.There are many boatmen that offer you a trip around the river but if you are just looking for the kingfisher and the pitta the best option is to walk along the mangrove boardwalk.I went there my first day,excited to see these awesome birds.At around 6:45 am i arrived at the boardwalk,just a short walk from the downtown,beside the river.After spotting some birds,around 7:00 am I listened the sound of the superb Brown-winged kingfisher,a huge kingfisher with brown wings,red bill and orange body,similar in size,shape and colors to Stork-billed Kingfisher.It was a quite conspicuous and noisy bird,not shy and easily seen when listened its call.It appear in the middle storey,around 10 meters from where I was walking.The Mangrove Pitta was the next target.After using my recording ( I apologize for using it, but i don t usually use the calls for avoiding to interfere in their behavior ),this pitta was very responsive and after a few minutes answering the call,appeared on my left side,next to the boardwalk, at just 1 meter ! where i could take a very nice picture.So excited of watching these magnificents birds, I came back to the hotel to tell it to my wife. The other side of the coin was Khao Nor Chuchi.To get there is not so difficult.Firstly you must stop in Klong Tom.From the highway in Krabi, it s easy to get onto a bus to Trang.After 40 minutes you arrive in town and you must get into a motorbike to Khao Nor Chu Chi.I payed around 250 baths.Once there I slept in Morakort Resort,but you can find other accomodation as well and even at more affordable prices.You can ask for a professional birdwatcher guide but the rates are very abusive: 6500 baths per day! Next day i woke up early very excited to see the pittas and the Green Broadbill,and other interesting birds of the area.My first goal was to reach the U trail,a narrow trail that after spending many hours there the results were not as I expected.I couldn t find The Gurney Pitta. 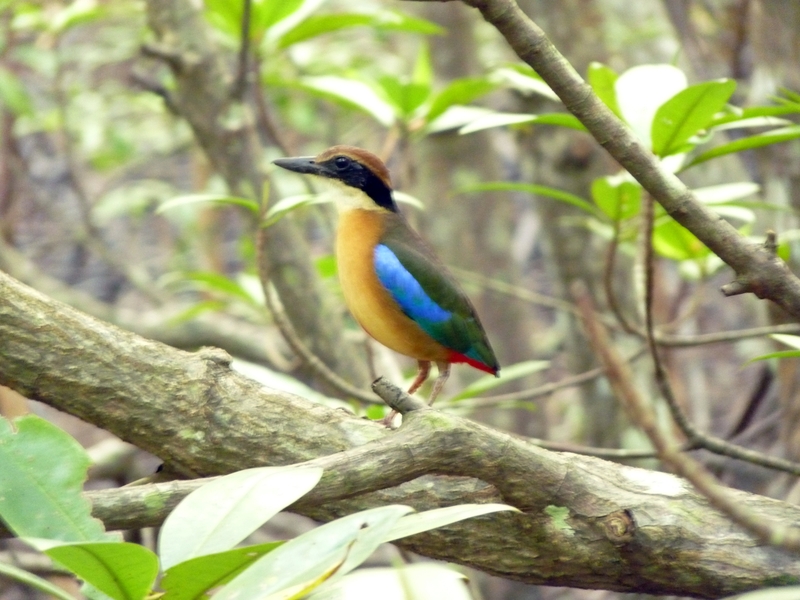 Next day I went to the B Trail with better results.I often hear Banded Pitta in the first part of the trail at different hours ( in the morning,midday and afternoon ).Near the junction with the C trail, the day before, a birdwatcher listened a Gurney’s Pitta but I couldn t get a view of these excellent bird.Around these area I could see on the top of a tall tree a Green Broadbill,in the morning, another impressive bird to see but no as the other both pittas.Birdwatching,however,in this area is very hard and frustrating and if you want to get good views of the most amazing birds here you have to spend some days. I spent 3 days there and my experience is sweet and sour…expecting to find more.Anyway the birds that I could see were so impressive that it s worth to travel to this area for any birdwatcher.